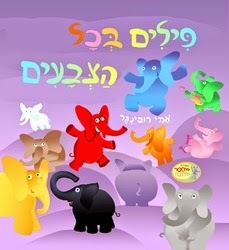 Synopsis: In this book from Ami Rubinger, author and illustrator of “Big Cat, Small Cat” and “Dog Number 1, Dog Number 10,” we learn that elephants are a colorful bunch. Bilingual benefit: This book introduces colors through whimsical illustrations and verse that requires the reader to complete the rhymes. Like many of Mr. Rubinger’s books, this particular one is available in both English and Hebrew. Our toddler is able to complete the rhymes easily in English.